Dan Reid holds a BA in Humanities, with a double-major Communications, from York University. 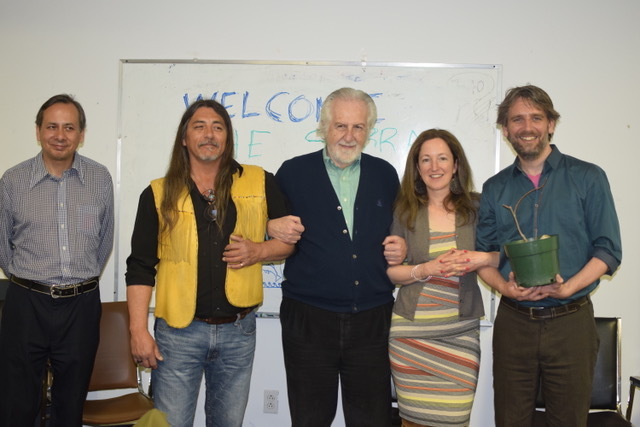 Dan has enthusiastically joined with Sierra Club Quebec to actively promote environmental protection, in keeping with his Daoist values for a harmonious coexistence with nature. Having taught himself to read and translate Classical Chinese, Dan has published English translations of early Daoist texts, found in his books The Thread of Dao: Unraveling Early Daoist Oral Traditions in Guan Zi’s Purifying the Heart-Mind (Bai Xin), Art of the Heart Mind (Xin Shu), and Internal Cultivation (Nei Ye) and The Ho-Shang Kung Commentary on Lao Tzu’s Tao Te Ching. Dan studies Kung Fu, Chinese massage therapy (Tui Na), and occasionally leads Qigong practice groups. He has worked in various fields, from marketing, to construction, to cooking in restaurants, and playing percussion and jazz guitar. Dimitri Roussopoulos is a political activist, ecologist, writer, editor, publisher, community organizer, and public speaker. Educated in philosophy, politics and economics at several Montreal universities and London. Roussopoulos has sought to keep himself free from any academic confinement, and apart from having taught for two years in the late sixties at a college that followed the progressive education philosophy of John Dewey, he has remained institutionally independent. Since 2001 Dimitri Roussopoulos heads the Taskforce on Municipal Democracy of the City of Montreal, helping to draft the Montreal Charter of Citizen Rights and Responsibilities, the first right-to-the-city charter in North America which was recognized by UNESCO as an important innovation in democracy. Active with and promoting the World Social Forum, Roussopoulos continues to advance the need for an extra-parliamentary opposition in Canada. Grand Chief Serge Simon is the elected Grand Chief of Kanesatake First Nations and one of the co-founders of the Treaty Alliance against Tar Sands expansion, an anti-pipeline group that now comprises 115 chiefs from First Nations across Canada and the United States. The Grand Chief Serge Simon was born in Kanesatake and is of the Turtle clan, of Mohawk and Algonquin descent. He is a firm believer in unity, above and below with chiefs across the land. Dr. Isabelle-Anne Bisson is an expert in environmental impact and community needs assessment, helping organizations achieve sustainability. Dr. Bisson has over 20 years of experience as a scientific consultant, coordinator and manager of science and conservation projects globally. She has lead projects for the United States’ Department of Defense and headed a program in Uganda for a United States Agency for International Development initiative. She completed a B.Sc. and M.Sc. in Science at McGill University in Montreal and a Ph.D. at York University in Toronto. She went on to conduct post-doctoral research at the Smithsonian Environmental Research Center and at Princeton University. In 2014, she co-founded and is now solely running a firm that offers expert services in sustainability. Recently, she worked closely with northern Aboriginal communities and the environmental challenges they face with ongoing development. She is fluent in French, English and Spanish.